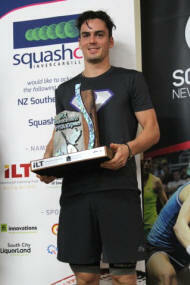 New Zealand’s Paul Coll claimed a third successive PSA World Tour title after overcoming Hong Kong’s Tsz Fung Yip in the final of the ILT - Community Trust NZ Southern Invercargill Open, PSA M15 tournament held in the Squash City club in Invercargill. Top seed Coll came into the event following back-to-back victories on home soil at the Fitzherbert Rowe Lawyers New Zealand PSA Classic and the Squashways Christchurch Open, and dropped just one game, against semi-final opponent Rex Hedrick, en route to the final. Fung Yip, meanwhile, was also in fine fettle in the build up to the showpiece finale, and the number two seed followed up wins over Evan Williams and Joshua Larkin by triumphing over the in-form Englishman Angus Gillams in the last four. It was Fung Yip who started the brighter of the two, and the World No.49 went 6-3 up in game one, before Coll found his range and rattled off eight points in succession to go 1-0 up. A dominant display from Greymouth-born Coll then saw him concede just three points in the second game as he doubled his advantage. Fung Yip dug in his heels though, and won the battle of wills in the third after overturning a match ball for Coll to claw a game back and send the match into a highly-charged fourth game. A vociferous crowd was treated to a series of gruelling rallies which saw both players exhibit great energy, athleticism and agility as they sought to push each other to the limit. Coll, the World No.34, came out on top in the crucial moments and snuck ahead towards the end of the game to close out a hard-fought 11-6, 11-3, 13-15, 11-8 victory in 54 minutes to lift his 11th PSA World Tour title and extend his unbeaten run to 12 matches. The top four seeds in the ILT – Community Trust NZ Southern Invercargill Open, headed by New Zealand No.1 Paul Coll, will contest the semi-final places of the PSA M15 tournament held in the Squash City Club. Coll, who is looking to claim three successive PSA World Tour titles for the first time in his career, took to the court against England’s Joshua Masters and forced a number of errors from the number six seed after working him around the court well to take the opening game. A strong response from Masters in game two saw the duo trade points until the mid-way point, where more errors from the 21-year-old gifted Coll a two-game advantage, who then dictated the tempo of the third to take it for the loss of a single point, securing an 11-5, 11-8, 11-1 victory to send him through to the semi-final. Coll will line up against Australia’s Rex Hedrick for a place in the showpiece finale, with Hedrick coming through an entertaining three-game match against Welshman Peter Creed. Angus Gillams, the Englishman who has won two of his last five PSA World Tour events, will join Coll and Hedrick in the last four courtesy of a 3-1 triumph against eighth seed James Huang. He will face Tsz Fung Yip in the next round, with Fung Yip beating Joshua Larkin in a match that ended with a stunning 39-shot rally. 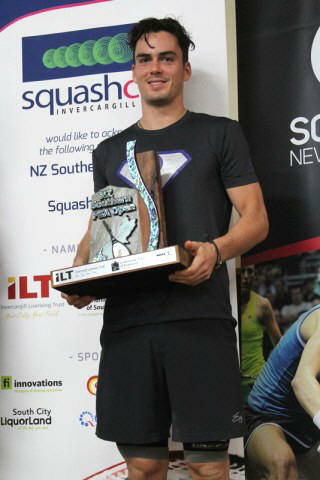 New Zealand No.1 Paul Coll spearheaded the charge of the top seeds in the opening round of the ILT – Community Trust NZ Southern Invercargill Open, PSA M15 tournament as all eight seeded players progressed to the quarter-final stage at the Squash City club. Coll, who has won his last two tournaments, came up against compatriot Lance Beddoes in his first round encounter, with the duo meeting for the third time on the PSA World Tour. The 24-year-old proved to be too strong for his fellow New Zealander and Coll dominated the court to triumph by a comfortable 11-1, 11-4, 11-3 margin of victory. The World No.34, who incidentally played his 200th match on the PSA World Tour, will look to extend his nine-match unbeaten run against England’s Joshua Masters in the last eight after he recovered from a 2-0 deficit to beat Australian qualifier Rhys Dowling. Last year’s runner-up Tsz Fung Yip is also through to the quarter-final after he saw off the attentions of home player Evan Williams. Fung Yip, who lost out to Raphael Kandra in the 2015 final, was clinical and precise with his shots throughout the course of the 29-minute fixture and stifled Williams’s attempts to hit winners to come through in three and set up a next round meeting with Joshua Larkin, who overcame Matias Tuomi. Meanwhile, Rex Hedrick will contest a quarter-final fixture with Welshman Peter Creed after they beat Ashley Davies and wildcard Ben Grindrod, respectively. The other quarter-final encounter sees England’s Angus Gillams pit his wits against James Huang of Taiwan. Gillams achieved a routine straight games victory against Sion Wiggin to advance unscathed, while Huang swept past Mohd Syafiq Kamal to win 3-0.